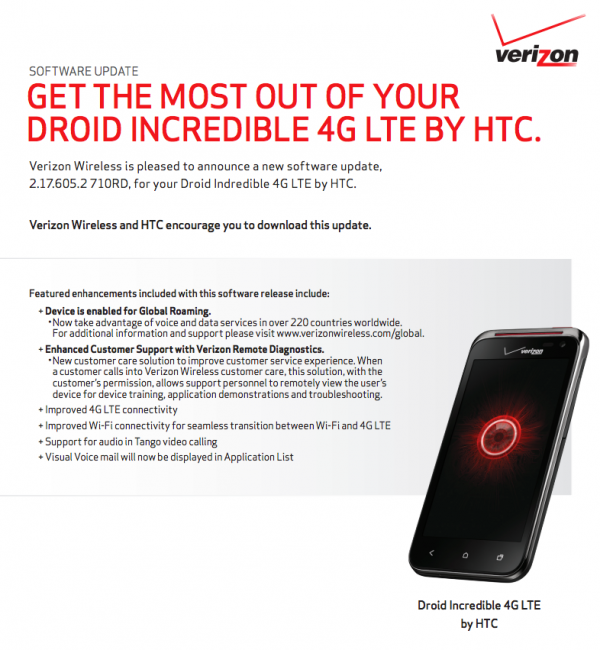 Verizon announced a new update for the DROID Incredible 4G LTE last week, one that would include global roaming, their Remote Diagnostics tool, and support for Isis Mobile Wallet. In a semi-confusing move this morning, they tweaked the changelog for the update so that it no longer includes a mention of Isis. We reported last week that Isis was set to kick off on October 22 in two test markets and that the Incredible 4G LTE would be the signature launch phone from Verizon for it. This move doesn’t necessarily mean that this phone isn’t going to be the lead device, but maybe that Verizon doesn’t want the entire country of Inc 4G owners asking about Isis when only Austin, TX and Salt Lake City, UT owners will be able to use the mobile payment service. No matter what, this shouldn’t be cause for concern. Isis will rollout nationwide before we know it, and our wallets will soon be replaced by phones. Assuming they are accepted into the program, that is.